Alzheimer (ALTS-hy-mer) disease (commonly called Alzheimer's disease) is a condition in which abnormal structures (calledplaques and tangles) form in the brain, accumulating over time and interfering with nerve cell connections. The disease leads to problems with memory and thinking and to changes in personality and behavior, called dementia (de-MEN-sha). "The woman, 51 years of age, showed as her first symptom a jealousy towards her husband. Soon she showed a rapidly increasing amnesia; she became lost in her own apartment, carried objects about aimlessly, hid them, sometimes believed she was to be murdered, and had spells of unrestrained screaming.… The autopsy showed a diffusely atrophied brain … remarkable changes of the neurofibrillae. In place of a normal cell, one or several fibrillae, which ran parallel to each other, were altered in a similar fashion. Over the entire brain, and especially in the upper layers, miliary centers appear, which were caused by an unusual substance … The glia became fibrous, and many glia cells showed fatty deposits.… Apparently we are dealing with an unidentified illness." Alzheimer disease is named after Alois Alzheimer, the German physician who first described it in the early part of the twentieth century. Some people mistakenly call this condition "oldtimer's disease." Their mistake reflects the fact that it usually affects people age 65 and older, with advancing age being the single biggest risk factor for the disease. (There is an early-onset form of Alzheimer disease that strikes middle-aged adults in their thirties, forties, or fifties, often affecting several members of the same family. This form of the disease is much less common.) Experts estimate that 1 in 10 to 1 in 20 Americans over age 65 have Alzheimer disease, which translates to about 4 million people. Since people are living longer than ever, as many as 14 million Americans may have this disease by the year 2050. In Alzheimer disease, structures called plaques and tangles form in the cerebral (se-REE-bral) cortex (KOR-teks), which is the outer surface of the brain, as well as in the brain matter just under the cortex. The cortex has several functional areas, including those involved with vision, hearing, speech understanding, and bodily awareness. These structures interfere with the normal functioning of the neurons (NU-rons), or nerve cells, and the transmission of messages between the brain and other parts of the body. Although these plaques and tangles occur to some extent with normal aging, they are much more prevalent in people who have Alzheimer disease. It is important to keep in mind that this disease is not a normal part of getting older. At first, the condition usually hinders certain aspects of immediate memory. For example, a person might consistently forget where certain key possessions are, leave a boiling pot or kettle on the stove, or repeat the same stories. Gradually, symptoms worsen, affecting a greater portion of a person's memory and then, quite often, personality, decision-making abilities, and language skills. Everyday activities, such as working at a job, driving a car, keeping house, balancing a checkbook, and participating in social activities, become impossible. As the disease advances, people who have it seem less and less "like themselves," often showing drastic mood swings, unpredictable changes in temperament, inability to recognize loved ones, and increasing helplessness. At this point, people with Alzheimer disease usually need full-time care. 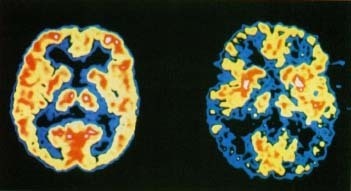 These positron emission tomography (PET) scans show the dramatic difference in brain activity between a healthy person (lfit) and a person with Alzheimer disease (right). Brain activity, indicated by red and yellow, has been greatly reduced in the brain at right. curing it. Neuroscience researchers are actively investigating these areas. They have discovered certain therapies that appear to help with the symptoms of Alzheimer disease. For example, the Food and Drug Administration has approved drugs that help slow memory loss and lessen other disease symptoms. These drugs increase the brain's level of acetycholine [a-see-til-KO-leen], a brain chemical involved in sending messages from nerve cell to nerve cell to allow the brain to function normally. At present, Alzheimer disease is diagnosed based on a person's symptoms and by ruling out other possible causes. While there is no single test to show that a person has the disease, doctors now have access to technological methods that may prove very useful in diagnosing it. Using computerized tomography * scans and other special brain imaging techniques, doctors can examine the structure, blood flow, and metabolic activity * of the brain. These tests can help show the presence of Alzheimer disease. The causes of Alzheimer disease largely remain a mystery, except in the less common early-onset form of the disease, which is clearly linked to genes * . For the more common form of the disease, researchers have not been able to trace a clear link to heredity or to other factors, such as dietary habits, occupation, personality type, or environmental factors. Researchers are working to identify how a person's genetic makeup and environmental factors might interact to cause this condition. At present, there is nothing a person can do to prevent Alzheimer disease, nor are there any tests available to predict whether someone will get the disease. Research in these areas may yield useful treatments for Alzheimer disease and maybe even a vaccine to prevent the disease. * computerized tomography(CT), also called computerized axial tomography, is a com-puter imaging technique using x-rays. These CT scans take images of 'slices' of the body and brain (which do not involve actual cuffing). Doctors can view these detailed images to find out what is going on inside a person. * metabolic activity refers to the process in the body that converts food into energy and waste products. * genes are chemicals in the body that help determine a person's characteristics, such as hair or eye color. They are In-herited from a person's parents and are contained in the chro-mosomes, threadlike structures inside the cells of the body. Klein, Norma. Going Backwards. New York: Scholastic, 1986. In this novel for young adults, family dynamics are strained when Grandmother Gustel, who has Alzheimer disease, moves in. Although Charles, a high school senior, tries to cope with his grandmother's disease, his father refuses to recognize the problem. Wilkinson, Beth. Coping When a Grandparent Has Alzheimer's Disease. New York: Rosen Publishing Group, 1995. Alzheimer's Association, 919 North Michigan Avenue, Suite 1100, Chicago, IL 60611-1676. This health organization funds research into the causes, treatment, and prevention of Alzheimer disease and provides education and support to people affected with the disease and their families through a national network of chapters. Alzheimer's Disease Education and Referral Center, National Institute on Aging, National Institutes of Health, P.O Box 8250, Silver Spring, MD 20907-8250. This center, a service of the U.S. government, provides research updates and referrals on its website. Neuroscience for Kids is a website maintained by Associate Professor Eric Chudler at the University of Washington, Seattle. It features easy-to-understand information on a range of topics related to the brain and nervous system, including Alzheimer disease. The website gives an extensive bibliography of readings for children and teens.